When this verse in Second Corinthians says we are changed into the “same image,” it is referring to the image of Jesus Christ. Being transformed into His image is the goal, the ambition, of every true believer. But how do you become more like Jesus? Many people try ways that may sound good, but will not help you become more like Jesus. You're not going to become like Jesus by elimination. You can't simply take things out of your life. Some folks want to be like Jesus, so they make a list of sins and try to eliminate them from their lives. They become proud of what they don't do, but they're not one bit more like Jesus. A telephone pole doesn't smoke, drink, or tell lies; but it's not like Jesus. Elimination doesn't deal with the root just like pruning a tree doesn't change its nature. Also, you won't become like Jesus by imitation. You can't just try to be more like the Lord Jesus Christ. Now, there's a certain sense in which Jesus is our Leader; but if all you do is imitate Him, you have become a cheap little imitation. Have you ever seen artificial, plastic flowers? Well, there are a lot of plastic Christians around trying to imitate the Lord Jesus Christ, but they will never, ever make it. Finally, you're not going to be more like Jesus by determination. You might say, “I'm going to be like Jesus even if it kills me.” But you don't have in you what it takes. If you were drowning, you couldn't reach up and take the top of your hair and lift yourself up out of the water to save yourself. You just can't do it. And I don't care how determined you are; you will never be more like the Lord Jesus Christ by sheer determination. Now, having said how not to try to make changes, let me tell you how you do become more like Jesus. You must become a spiritual mirror. When you understand that you are a mirror, you are going to understand how to be transformed into the likeness of the Lord Jesus Christ - by beholding or reflecting the Lord Jesus Christ. Now, let me give you three laws of transformation that deal with a mirror. First, as a mirror you must receive the image of Jesus Christ. A mirror does not create an image; it only receives one. Jesus Christ is the image; you are the mirror. And you must receive the Lord Jesus Christ. You must receive His image. · clean and uncovered - A draped or soiled mirror cannot receive an image. There are a lot of people with a blinded mind, which just puts a shroud over their hearts. You must be open and willing to receive Jesus. · pointed in the right direction - The mirror is going to receive whatever it is pointed at. The secret of becoming like Jesus is to receive the image of Jesus by constantly beholding Jesus. · in the light - In the darkness, a mirror can't reflect anything. You must stay in His light and keep focusing on the Lord Jesus Christ. Not only must you receive the image of Jesus; you must retain the image of Jesus. If you keep your heart fixed on Jesus, the image will not disappear. If you're saved, your inner nature is Jesus Christ. And when you are transformed, that inner nature comes to the surface and you're changed. You will continue to become more and more like the Lord Jesus Christ because you are a mirror that receives His image. And then, by continuing to behold the Lord Jesus, you will retain His image. And finally, you must reflect the image of Jesus Christ. As I have already said, being like Jesus is not accomplished by imitation but by reflection. Imitation is mechanical and occasional. But a mirror doesn't have to work to reflect. Many times, you'll not even be aware that you're reflecting Jesus because it just becomes second nature. So, you see it's easier than you thought to become like Jesus. He'll do it. Just rely on Him. When Christ the Lord came down. Where fleecy flocks were kept. "The Christ is born tonight." But "God with us" that day. Was born, His life to give. Wesley Brown, missionary from the American Baptist Churches, USA, Board of International Ministries, sent this exciting story of a new plan by one of the students of the International Baptist Theological Seminary, Prague, Czech Republic, to persuade his people to read the Bible. How do you persuade Czech atheists to read the Bible? Alexander Flek, who completed his Masters of Theology in Biblical Studies here at our Seminary, is the chief translator of a new contemporary version of the Bible in Czech. When its revision was recently published, he and several colleagues got a brilliant idea for getting Czechs, who are predominantly atheists, to read it. He and his friends decided to read the New Testament through - aloud - on the street near the Mustek Metro (subway) station! It took them 17 hours. Czech radio personnel came, broadcast portions and interviewed people. As readers read under a sign that said, "The Bible for All People," some ridiculed. However, Alexander invited some who listened, including atheists, to read a paragraph or two aloud as part of the marathon reading, and some did. An actress came by after her nightly theater performance, was invited to read a paragraph and ended up reading six chapters from Hebrews! Many passers-by had never read or heard a paragraph of the Bible before! Numerous conversations and questions were answered on the sidelines, and copies of the New Testament distributed. Since surveys show that over 70% of Czech adults are atheists, I thought their initiative was innovative and courageous. Pray that many who heard a portion may be moved to read more for themselves and be led to repentance and faith in Christ. God is so wonderful! In less then one month I got my work and residence permit! Now I can start to make short-term and long-term plans to revive the Baptist Bible School (BBI). I revisited old places and friends, and I hope you enjoyed my report of the Women's Conference at Ascension Town Baptist Church, as well as my visit to Hillside Baptist Church. I still have some interesting stories and photos to share later but now I am excited about the Bible School. It is a great privilege that I can be involved in training young men and women to carry out their ministry in the church, especially to start and develop new churches fulfilling the Great Commission. I did that for several years, and it is so encouraging to see how God blessed the ministry of my former students through the years. To God be the glory! Nothing that I have accomplished is for my credit, but it is still very rewarding to know that I didn't work in vain. However, I don't want to live with memories of the past. I believe God prepared something for the present and the future as well. Of course, Satan is not happy about my willingness to serve God with all of my strength and he does everything to slow down the progress. He hindered so greatly my return to Sierra Leone and then attacked me in so many ways during the last years. Now he turned on the wife of my local supervisor and college with whom I should work out the action plan for the BBI. The wife was first admitted to the hospital with malaria, then the second time with typhoid fever and high blood pressure. Her husband is busy running in and out the hospital. He not only has to take care of their two children at home, but must prepare and bring food to his wife (food is not provided in the hospitals). It is very difficult to communicate with her husband but, thank God, last week we were able to sit down for a few minutes. We agreed to start in November with a ten-day intensive BBI course for a limited number of students in the Freetown area. There are more than 40 churches in the vicinity of the capitol, and many young people would like to be enrolled in this kind of training program. Presently, I cannot start with more than 10-15 people because there is no sufficient funding. I have to provide a minimum of one meal per day, and there are other expenses as well. I have only a rough idea how much it would cost, but I hope that God will provide. I am over the shock of finding out that nothing was budgeted for the BBI by the local Baptist Convention. But I am not worried because I know that all things are possible with God, and I experience His help step by step. It is always like this. Whenever I am a little discouraged, something happens to encourage me as if God sent His message: "Don't be afraid. Don't you see that there are more with you than against you? … Most of all, I am with you." If He is with us, who is against us? I thank you that you are also with us at least in your prayers. There are times when I wish some of you were here physically as well, because then I could tell you that "the harvest is plentiful but the workers are few ..." Please pray that God will send more workers to His harvest. Pray for me as well. Pray that I would have a smooth start with the Intensive BBI. That the Lord would send students who want to learn the most and be willing to utilize what they learn; choosing the right books, teachers and cooks; that we would be covered with the love of God and the grace of Christ. And that Satan would give us a break! Please remember in your prayers the young wife of a new believer, Alimamy, who is due to give birth to her first baby. Alimamy is the son of an imam (a type of Muslim priest). His 18-year-old wife is the daughter of another imam. Alimamy came to Christ a couple of years ago and was baptized, but his wife is still in the baptism class at Ascension Town. She is due to give birth to her baby any minute. According to their estimates, she is past nine months in her pregnancy. Although this Christian couple is not persecuted by their Muslim families, any complication would give relatives reason to attack their faith. Please pray that Alimamy and his wife would be able to testify about the life and soul-saving grace of our Master, Jesus Christ. I did it a hundred times before. It was the same thing as always. I was asked by someone to do something in front of the church, and I agreed to fill the slot. Step by step I would walk up to the stage thinking: “Just get it over with”. This Sunday morning, I was in New York at a youth conference, but it felt just the same. I walked towards the stage. The band was there, as was my microphone just waiting for me. The first note I sang wasn’t mine, but it was God through me. I felt sudden chills down my spine and I instantly knew, I wasn’t doing this for me, I was doing it for Him. I was serving Him. I felt His presence. I felt Him there, through me, inviting others to come worship His name in song! For the very first time I felt larger then life, because I wasn’t alone, He was with me. 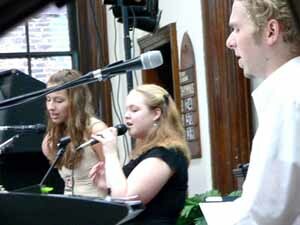 Even though the concept of singing in front of the church was the same, that Sunday was the first time I ever fully worshiped God, and the first time I ever served Him and not myself. My Saviour died for me, and I was serving Him giving everything I had. Serving God was the topic for that weekend, and I learned about it through experience. I learned that to make serving Him worth anybody’s time, it has to come from your heart, and you have to totally support what you’re saying or doing. I learned that serving God is not a burden but an honour and a privilege. If God could make serving Him with all my heart be that thrilling and exhilarating, I can only anticipate days of serving my Lord again. The Baptist World Alliance, extending over every part of the world, exists as an expression of the essential oneness of Baptist people in the Lord Jesus Christ, to impart inspiration to the fellowship, and to provide channels for sharing concerns and skills in witness and ministry. The Alliance recognizes the traditional autonomy and interdependence of Baptist churches and member bodies. 1. To promote Christian fellowship and cooperation among Baptists throughout the world. 2. To bear witness to the gospel of Jesus Christ and assist member bodies in their divine task of bringing all people to God through Jesus Christ as Savior and Lord. 3. To promote understanding and cooperation among Baptist bodies and with other Christian groups, in keeping with our unity in Christ. 4. To act as an agency for the expression of Biblical faith and historically distinctive Baptist principles and practices. 5. To acts as an agency of reconciliation seeking peace for all persons, and uphold the claims of fundamental human rights, including full religious liberty. 6. To serve as a channel for expressing Christian social concern and alleviating human need. 7. To serve in cooperation with member bodies as a resource for the development of plans for evangelism, education, church growth, and other forms of mission. 8. To provide channels of communication dealing with work related to these objectives through all possible media. When I see a flock of sheep I see exactly that, a flock. A rabble of wool. A herd of hooves. I don't see a sheep. I see sheep. All alike. None different. That's what I see. But not so with the shepherd. To him every sheep is different. Every face is special. Every face has a story. And every sheep has a name. The shepherd knows his sheep. He calls them by name. When we see a crowd, we see exactly that, a crowd. Filling a stadium or flooding a mall. When we see a crowd, we see people, not persons, but people. A herd of humans. A flock of faces. That's what we see. But not so with the Shepherd. To him every face is different. Every face is a story. Every face is a child. Every child has a name. The Shepherd knows his sheep. He knows each one by name. The Shepherd knows you. He knows your name. And he will never forget it. I have written your name on my hand (Isa. 49:16). Quite a thought, isn't it? Your name on God's hand. Your name on God's lips. Maybe you've seen your name in some special places. On an award or diploma or walnut door. Or maybe you've heard your name from some important people - a coach, a celebrity, a teacher. But to think that your name is on God's hand and on God's lips ... my, could it be? Or perhaps you've never seen your name honored. And you can't remember when you heard it spoken with kindness. If so, it may be more difficult for you to believe that God knows your name. But he does. Written on his hand. Spoken by his mouth. Whispered by his lips. Your name. Since his works had not become public until communism was ousted, few Hungarians heard about Tibor Tollas until the new Republic of Hungary was established in 1989. When the Rev. Joseph Novák, pastor of the American Hungarian Baptist Church in Alhambra, California, learned that my late husband Sándor Vereczky and I knew Tibor Tollas, I was asked to write about this great Hungarian patriot, author and poet. Sándor and I first met Tibor in 1965 in Daytona Beach, Florida, when he was an honored guest at a fundraiser for his newspaper, Nemzetör (The Guardian). I shall never forget the rapt attention and stunned silence among the American guests who did not understand a word as he passionately recited from memory his poem Bebádogoztak minden ablakot (They’ve Walled Up Every Window Tight With Tin). Prison inmates had asked Tibor to write this poem when the guards began sealing up and blocking the only ray of light in their dark prison cells. It eventually became the standard-bearer for those seeking liberation from the totalitarian dictatorship. Tibor Kecskési Tollas, an officer in the Hungarian army, had spent nine years as a political prisoner at the infamous Vác prison and other penal institutions where inmates communicated by tapping messages in code on prison walls He helped ease those years of physical abuse and solitary confinement by composing poetry and his messages to the outside world were smuggled out of prison on ragged sheets of toilet paper, deftly rolled into cigarettes. Tibor escaped during the aborted 1956 Hungarian freedom uprising and began publishing a newspaper, Nemzetör (The Guardian), in Munich, Germany. It has been published in Hungary since 1989 when the nation was freed from Soviet rule. A magnetic and warm personality totally dedicated to his cause, Tibor traveled around the world for subscriptions to help finance his newspaper. It was being published in five languages and had a worldwide readership. When my husband and I moved from Daytona Beach, Florida, to Los Angeles in 1968, the good Lord must have directed our future because Tibor was visiting in California at that time. Learning that we were in the area, he immediately introduced us to renowned Hungarian actress Éva Szörényi and members of the Los Angeles Chapter of the Hungarian Freedom Fighters World Federation. We participated in the Federation’s struggle to help liberate the Hungarian people and Tibor often visited us in Thousand Oaks, California. While he rested at our home on a sunny hillside, he talked about his years of imprisonment, enduring forced labor in the mines, and how he had become the voice for prisoners at Vác. Tibor confided to us that he never planned to become a poet or newspaper publisher. It seemed those years of suffering changed his perspective of life and he wrote numerous poems with deep insight into the existence so many of us take for granted. He had a warm, magnetic personality and loved people. Fred Hefty, another political prisoner who maintained friendship with Tibor through the decades, told me at his home in Big Bear City, California, that Tibor had been caring and compassionate toward others even during the rigors of life in prison. He seemed to love everything about life. When my mother passed away in 1988, he dedicated a poem to her memory. A prolific writer, numerous books were published with Tibor’s beautiful compositions and he continued to travel around the world accepting support for his beloved newspaper. He told us that he became bored during an illness and a friend suggested he write about trees greening outside his hospital window. In his book, Irgalmas Fák (The Merciful Trees), the closing poem dramatically portrays the tree of crucifixion on which our Lord Jesus Christ was slain. Tibor’s poetic legacy will expand as his magnificent work banned under communism becomes better known and admired by Hungarians. Several already have been translated into English, including Bebádogoztak minden ablakot. Moments Sándor and I had with Tibor Tollas are precious memories, and I thank God we had the privilege of meeting this great Hungarian patriot. Sándor and I were saddened when our friend passed away in 1977 at the age of 77. His biography is included in his volume of verse, Hazafelé (Homeward Bound) and a museum in his memory was dedicated in the 1990s at Nagybarca, Hungary. Despite the best efforts of the news media, it's impossible to sense the confusion, observe the destruction, smell the stench, hear the cries, dry the tears, clothe the threadbare, as well as hug and feed the hurting and hungry unless you're here. This is a disaster of biblical proportion, and it demands a biblical response –– now. How can I be more explicit? This situation is dire –– it's an ongoing emergency. We dare not speak on God's behalf to explain why He allowed these particular acts of evil to happen at this time to these persons and in this manner. Yet, at the same time, we dare not be silent when we should testify to the God of righteousness and love and justice who rules over all in omnipotence. Humility requires that we affirm all that the Bible teaches, and go no further. There is much we do not understand. As Charles Spurgeon explained, when we cannot trace God's hand, we must simply trust His heart. Personally, I contend that the best thing for us to do in the aftermath of Katrina is to remain silent, and not try to explain this tragedy. Instead of asking "Why?" we should be asking, "What does God want us to do now?" The loving God calls all believers in the face of Katrina’s devastation to seek ways to express love in concrete ways towards those who have lost friends and family members; and to those who have lost homes along with most of their earthly belongings. Please help our mission work in Serbia! Our Hungarian Baptist Church helped hundreds of refugees, orphans, handicapped, flooded people for over ten years. We offered them food, clothing, firewood, medicine and a word of encouragement. We feel that the time has come to serve with the Bread of Life to this people whom we already helped physically. God showed us miraculously a big house which offers us many possibilities for our mission work. This 475 m2 house in a nice rural setting - which was the residence of a prominent lady, Aliz baroness - would be suitable for us to organize a Mission Center there. We would like to buy this house - at the moment we are renting it. The house has many rooms, it has a big courtyard - it is ideal for summer activities, perfect for any kind of children ministry. Presently we can accommodate some 35-40 childre and that could be expanded to 120. In Serbia Evangelical mission centers with camping possibilities are very sporadic today. We would like to change that too. * Summer camps for children, English classes, sport and music camps. * Classes to prepare people for Humanitarian services and work among the disabled. * Organize aid-programs for North-Bacska - we have some 15 years of experience. Serve the hungry with physical and spiritual bread, offer them a place to regain strength. The programs are already in place at the house. We would like to buy that house - at the moment we are renting it. We spent several thousand hours and dollars to this building through the unselfish contributions of our church members. Now we would like to buy this house because we see the opportunities there for us to continue the missionwork we started. This is why we request your help or the financial assistance of your organization or church. We need $65,000 US to buy this building. We can’t do that alone. Our maximum contribution is about 25% of the total. We are trusting the Lord with the other, bigger part and are looking for partners who would help us in this mission project. * With you labor during the update of the building. Early at the start of the 20th Century, Baptists made a history making move when they came together in 1905 and founded the Baptist World Alliance in London, England. In 2005 the BWA will celebrate its 100th anniversary with a Centenary Congress in Birmingham, England, July 27-31. The theme of that Congress is "Jesus Christ Living Water." Let us pray for this historic event. 1. Like every Christian, you have a powerful testimony to share. 2. You have had the experience of salvation through Jesus Christ. 3. Your story is unique and interesting. 4. Your story will catch the attention of the unbeliever. 5. Through your story, people will realize, that they too, can experience the Lord Jesus. 6. A Personal Testimony is difficult to refute. It did happen, and it happened to you! 7. The power of God will accompany the sharing of your experiences. 1. You should be able to tell it in 2-3 minutes. 2. Write out your Personal Testimony using a Three-Point Outline. 3. Practice reading it several times, until you feel comfortable saying it. 4. Ask a person you know to allow you to share it with him or her. Introduction: "May I share with you the most wonderful thing that has happened to me?" Let the main focus of your testimony be on the NOW of your experience with Christ. Precise details of how Jesus became your Savior and Lord. - Avoid Christian jargon ("lost", "justified", "convicted", "redeemed")When useful, relate your testimony to Bible verses.Keep yor testimony up-to-date. ERLC President Richard Land has joined a diverse group of evangelical leaders in asking President Bush to strengthen his effort to overcome hunger and poverty in his second term. "A dramatic reduction in poverty, both here and abroad, would honor our Lord who called us to feed the hungry and clothe the naked," the Jan. 17 letter said. "It would also be a wonderful legacy for you to leave with the American people and indeed the world." The letter said the United States ranks last among developed countries in governmental aide to combat worldwide poverty. "Our nation has fallen far short of the increases in health and development assistance that you proposed," the letter said. "The richest nation in history can and must grasp the opportunity to lead. "While the leaders said their faith-based organizations would seek to heal the "poverty of the soul," they said such agencies could not solve "poverty of the wallet" by themselves. They called on Bush to place his administration on record in seeking to assure Americans "who work full time responsibly will be able to escape poverty and enjoy health insurance. "They urged the President not to allow effective, government, anti-poverty programs to be cut. Richard Land is president of the Southern Baptist Convention's Ethics and Religious Liberty Commission (ERLC). 98th ANNUAL CONVENTION - JULY 1-3. We cordially invite you to the 98th ANNUAL CONVENTION of the HUNGARIAN BAPTIST CONVENTION OF NORTH AMERICA. Location: Rama Hungarian Baptist Camp, Rama Road, Rama Township, Ontario, Canada. 10:00AM Worship service, Lord’s supper. "They tell me they are sending me to earth tomorrow but how am I going to live there being so small and helpless?" "But tell me, here in heaven, I don't do anything else but sing and smile, that is enough for me to be happy!" God replied, "Your angel will sing for you and will also smile for you every day. And you will feel your angel's love and be happy." "And how am I going to be able to understand when people talk to me if I don't know the language that men talk?" "I have heard that on earth there are bad men, who will protect me?" "O God, if I am about to leave now, please tell me my angel's name." When Dr. Christian Bernard performed the first human heart transplant, the medical world basked in the glow of human achivement. Sick and dying people were given hope that in receiving a brand-new heart, their lives would be extended. As great as this is, it pales in comparison to what God had done for His followers. He has been in the heart transplant business for a much longer time and - unique to His surgery - His patients live forever. May 15th is Pentecost Sunday. But will many Baptists celebrate the coming of the Holy Spirit? We celebrate Christmas. We celebrate Easter. But, do we celebrate Pentecost? If not, why not? Baptists tend to reject the Church year with all its various celebrations. 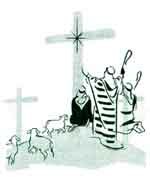 What is Epiphany Sunday, or Trinity Sunday or many other special holy days (holidays) of the Church? The Church year grew as part of the tradition of the early Church. Its function was celebratory but also educational. Many of the peasants could not read or write. The Church year became "teachable moments" for the early Church Fathers. Pentecost Sunday, 50 days after Easter, was a beautiful opportunity to meditate upon the Holy Spirit and the new life in Jesus Christ made eternally present by that same Spirit. Baptists need to take more seriously the doctrine of the Holy Spirit. Several years ago I wrote an editorial entitled, "Are Baptists Afraid of the Holy Spirit?" It was a source of aggravation for some and misunderstanding for others. But, if you are a missionary or if you visit overseas where the Christian faith is growing like wildfire, then you will understand why we need to take more seriously this teaching and open ourselves up to the movement of the Spirit. I just came back from Nigeria. What a joy to attend their annual meeting and to celebrate the joy of Christ with 20,000 believers! The Nigerian Baptists in recent years have not been hindered by their leaders, as previously, in physical expressions of the Spirit. What an amazing experience to hear 20,000 believers praying earnestly at one time! What a joy to see them clapping their hands and singing for joy! God is blessing the Baptist witness in Nigeria. In Ogbomoso there seems to be a Baptist Church on every corner. General Secretary S. A. Ishola reported that there are now three million baptized believers in Nigeria representing a worshipping community of more than six million! 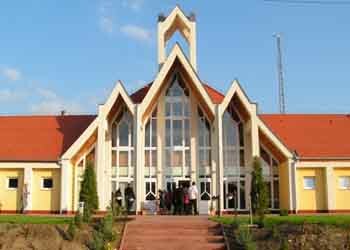 There are hundreds of primary schools, nine seminaries and Bible colleges and most recently a new Baptist university, Bowen University started three years ago with 500 students today has 2,700 students and expects to grow in the next two years to 5,500! Students are required to go to early morning prayer meetings. A Christian moral climate is maintained. Parents yearn for this and want to send their students to this new university. Of the 4,000 annual applicants less than 1,000 are accepted. Indeed, how can one explain the growth of the Church in Nigeria and all of Africa except that it is the work of the Holy Spirit! Karl Barth, in speaking to prisoners, celebrated the fact that when the hope of Christ comes into a man's life, a change takes place. In place of fear is hope. In place of sin is forgiveness, in place of fate there is mercy, in place of the grave is eternal life, in place of chance is God's will! The Holy Spirit always points to Christ! Barth put it this way: "In a word: where a person understands Jesus Christ, then it is no longer his own little human spirit, but God's own Holy Spirit who has given him the understanding and who gave his spirit the witness. That is the miracle of the Holy Spirit which makes Jesus Christ contemporary, which places Him and His truth in the center of the truth which is always true, the truth which is applicable for you and me through all times and generations. We the strangers, we the distant, are able to be stewards with God! Who would not rejoice at that? Who would not worship!" Through the work of the Holy Spirit, Christ becomes the center of our lives and the center of all history. When men and women come out of darkness into this life there is joy and laughter. The worship of God is not a duty but it is pure joy and ecstasy. And it is contagious. By the power of the Holy Spirit, the poor of this world, the hopeless, the distant ones now become children of God; now become a people of hope! The Holy Spirit is God coming into our lives and touching us with the joy and forgiveness of His Son, Jesus Christ our Lord. Now that is something to celebrate! That is why there is fantastic growth of the Church in the Southern hemisphere. That's why we need to open our lives to the movement of the Holy Spirit. Let's begin to celebrate Pentecost Sunday and make it a time of praying for worldwide and local evangelism. Indeed, "Come, Holy Spirit!" WOULD YOU RISK PRAYING FOR ME? Many times I was asked how it was possible that I was not afraid to leave the country where I was born. I first spent eight years in Sierra Leone, then another eight years in America. What was the secret? Not that I am extraordinarily brave. On the contrary, I am quite fearful. I like to sit in the one place I am used to. The secret of taking up a risk? I never was willing to move until I was sure that God wanted me to do so. Reading books about missionaries as a teenager I understood that God still wants people to go and make disciples of all nations. I also heard the gentle nudge to "dare to risk, to witness, to preach, to go and work for God." I will never forget the first time I was able to share my faith with two girls I met on the street. I felt as if angels were around me, whispering and encouraging me to talk! Before I was accepted at the mission council where I was presented as a candidate, I had a very discouraging talk with one of the leaders of the mission. After that I almost decided to quit. Again, the angels came to help me to be brave! In my dreams I have seen around me very bright people with uplifted hand. They were praying for me and pushed me forward. When I woke up I was sure that God wanted me to accept the job that was offered to me. Nevertheless, I was not protected from all fear. No, I didn't see lions, nor was I attacked by tigers. It happened only once that a bush spider found a home in my bedroom, and a viper with big eyes and swollen neck hissed on me in my storeroom. The biggest hindrance was the bloody civil war that broke out in the country and lasted for more than ten years. Sometimes I was sent to hold workshops near an area where rebels were fighting all night. Sometimes, when going to work, I have seen trucks of soldiers aiming their weapons on my car. Sometimes I heard them shooting in the air. Sometimes they broke into the house of my neighbor. When the rebels threatened Freetown (the capital) I had to leave. Soon, I found myself in America. Although I didn't plan that, a divine hand accurately arranged my coming to the USA and sorted out all the details of my staying here. Now it is time again to move. The war is over and I am invited back to Sierra Leone. The work is challenging but more difficult than it was before. I am asked to organize a mobile Bible School to help young people with small educational background and basic English learn the Bible and equip them to work as pastors in churches all over the country. First, I will go for five months. The Rama Hungarian Baptist Camp has been a very popular place for our convention meetings and the young people's retreat. A place to enjoy God's beautiful outdoors with a Christian emphasis. It is a facility located on beautiful Couchiching Lake which is an attraction for families. The community building which includes the dining room/kitchen is in very poor condition and needs replacement. Repair is not feasible because it has been repaired many times and "patchwork" is not lasting. Plans are ready to build a new building, but funds are limited. This is an opportunity for you to make an investment in the future of our young people and the camp. We are asking you to sincerely and prayerfully consider this worthwhile project. It is worth a sacrifice on your part. If you would like to share in this, please contact me, or send your contribution to our treasurer. So far I have 5 pledges of $1000.00 each. What can you give? Checks are to be made out to the Hungarian Baptist Convention designated for the Rama Camp and mailed to Mr. Louis Drescher. (2636 East 124th Street, Cleveland, OH 44120). All contributions will be gratefully received, properly recognized and the blessings of our Lord will be yours. "God loves a cheerful giver." Our Father: This is the season when our thoughts turn to the cross, and to the suffering of Your Son, our Savior. We have long known that His sacrifice was complete - He laid down His life. We have experienced the power of that in our own lives. We have acted on the fact that "Christ died for us." We do not wish ever to think lightly of the price Christ paid that we might be forgiven. We cannot begin to conceive of the suffering and the shame involved in His violent death. No words of ours can do justice to that awful scene. But we are humbled and grateful when we think that He suffered, bled, and died, in order to save us from our sins. We shall have all eternity to sing our praises for that! May the message of the cross be emphasized throughout all Your church this Easter season. May Your people turn again in repentance and renewed dedication to the Christ who so loved that He gave Himself. May we not be ashamed of the Gospel, which is the good news to salvation for all who believe. We are aware that there are many unhappy people in our world. There are so many for whom Easter means nothing. May Your servants continue to sow the seed of the Word, until none will be able so say, "No one ever told me before." There are folk who have lived in complete disregard for spiritual things. Before they become immune to the Gospel call may they find life in Christ. Bless our own friends and kin who stand in need of prayer... We all need Your constant care and guidance. We never know what a new day may bring. We trust You for the future, just as we have done in the past - perhaps more. Increase our faith, that we may go forward in life, with our feet on the ground and our eyes looking upward to You, "from whence comes our help." 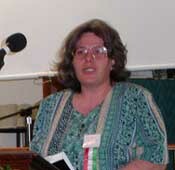 Kamilla Furedi plans to go back to the African mission field as soon as she can. Will you help Kamilla to accomplish her calling? "Hey, friend, do you know God loves you?" This is a popular approach to personal evangelism with certain evangelical Christians, but there is a serious question as to whether it is really biblical in the strict sense of the word. The Book of Acts is a history of the early church that spans roughly thirty years, and in that history book you cannot find the word "love" mentioned even once. This should convince us of at least two things: 1) people were not driving around the streets with "God Loves You" bumper stickers on the back of their chariots, and 2) personal evangelism did not consist of telling sinners that God loves them and has a wonderful plan for their lives. The central message of the Book of Acts is "Repent therefore and be converted that your sins may be blotted out" (Acts 3:19). There is no example in this book of a main character going into a city and announcing that he has come to proclaim or share the love of God with anyone. They obviously did not use this approach because they did not consider it the primary message of the cross. Surprisingly enough, though, many churches today do consider this the primary message of the cross. But why? Let's go back to our drunk in the alley. Wouldn't it make more sense to tell this fellow something like, "Hey, pal, you're in big trouble. There's a God in heaven who doesn't think too much of you and the situation you're in right now." Wouldn't this have a better chance of grabbing his attention than hearing that God loved himC which may not necessarily be true? If you walked up to the average person and told him that God loved him, his first reaction might be, "Well, why shouldn't he? I'm a pretty nice guy." That response would not do him much good, but it would be the response of most of the self-righteous who have yet to come under the conviction of their sins. Personal conviction of sin is paramount, as that is the opening through which God's love flows. If He is a just God, then He can truly love no other way. Divine love thrown out every which way to everyone equally is a degenerative form of love that soon becomes an easy-going apathetic tolerance that takes very little interest in the difference between good and evil. Furthermore, a God who is nothing more than loveC a God who loves every one always, regardless of their acts or beliefsC could not command the respect of anyone. He would fundamentally be an unjust God who has surrendered His own standardsC which is why there is no such thing as "God's unconditional love." Time and again we read in the Bible, "Blessed is he..." and "Blessed is the man who..." and after each we usually find an admonition to become or do something. Like it or not, we have a responsibility to act. This does not mean we work to earn God's love, but it does mean that none of us is an automatic recipient of that love. Does the God of the Bible love the drunken bum in the alley, the Mafia godfather, and the murdering terrorist, the same way He loves the God-fearing Christian who devotes himself to prayer and honoring his creator? Does "For God so loved the world..." (John 3:16) really encompass all this? Can we rightly use a few scattered verses of this nature and with them bulldoze our way through the rest of the Bible as if no other teaching existed? Psalm 5:5 says, "The boastful shall not stand in your sight. You hate all workers of iniquity." Psalm 11:6 says, "The Lord tests the righteous, But the wicked and the one who loves violence His soul hates." Evidently there are some who are not covered by the "God Loves You" bumper stickers. Nor in a righteous moral order should they be. We can engage in semantics and, as many do, purposely side-step the issue to avoid having to face an uncomfortable truth. But is all this really necessary? Should not the very obvious also carry some weight? God may have a general, but definitely no particular, love for those who by nature are children of wrath (cf. Eph. 2:3). Hosea says, speaking of Israel, "Because of their evil deeds I will drive them from my house, I will love them no more" (Hos. 9:15). Love them no more...? Is that possible? Evidently it is, so why play word games in order to negate the obvious? Why not let the Bible speak for itself and be content with what it teaches, and never mind defending pet doctrines that may be more acceptable to those too timid for hard thinking, or engaging in a form of "seminary-speak" that explains why the Bible doesn't really mean what it obviously says. Psalm 78:56-64 contains some very hard language against the people of God. Israel had gone bad. They had not kept the Law of God (cf. v. 56), they had fallen into idolatry (v. 58), and so they were given over to the sword to be killed (v. 62). God did this because He was furious and greatly abhorred them (v. 59). This is definitely not how one treats people who are always loved regardless, nor is it how one chastens an object of continuous love, any more than being in hell is the result of God's everlasting love. God discriminates between the righteous and the ungodly (Ps. 1:6, Matt. 25:46) in both this life and the life to come. Both cannot be the objects of His love. If they are then the word "love" has no demonstrable meaning. For many this is a new thought. We think of God as a deity to discuss, not a place to dwell. We think of God as a mysterious miracle worker, not a house to live in. We think of God as a creator to call on, not a home to reside in. But our Father wants to be much more. He wants to be the one in whom "we live and move and have our being" (Acts 17:28). Max Lucado, Grace for the Moment, January 6. Celebrate BWA Day! February 6, 2005. The first Sunday of February every year is Baptist World Alliance Day when Baptists recognize the larger body of Christ and pray for each other. We ask God to help those who are denied religious freedom and who suffer for their faith, and pray for the Gospel to reach the ends of the earth. The Baptist World Alliance is a fellowship of 211 Baptist unions and conventions comprising a membership of more than 32 million baptized believers. This represents a community of approximately 80 million Baptists ministering around the world. The BWA unites Baptists worldwide, leads in evangelism, responds to people in need and defends human rights. What does the BWA do? 1. Unite Baptists Worldwide"One Lord, One Faith, One Baptism." This Biblical truth of the oneness of the Body of Christ comes alive in the global meetings of the BWA, whether at an annual meeting of leaders in the world or a Congress with thousands of A Baptist World Congress is held every five years. This celebration of praise to God brings Baptists together to renew their faith in Jesus Christ and their commitment to serve the world. England is the venue for the 2005 World Congress to mark the 100th anniversary of the BWA. I believe planning and preparations are crucial in life. Often they require time, energy and sacrifice. I don't think organizers of the Detroit Youth Convention could count all the hours that they put into planning and "executing" the special November weekend. Those of us who were there can say that we received so many blessings in so many ways because of all the hard work and preparation they did. The theme of the weekend was Witnessing, Why, About What, How? I would like to highlight a couple of things which took place on Saturday. Saturday morning, Felix Pardi shared his testimony about how God was using somebody else in his life. He is the Creator of our lives, and He is the only one who is able to fill the void in our hearts. Although today's culture offers many different ways to fill our emptiness, none of them give the complete fulfillment which we can get only through Jesus Christ. Later on, Attila Kulcsar gave some practical advice on how to share our faith without fear. One of our excuses that we often use is that "We don't want to fail." But, somebody said: You only fail when you fail to share. This really touched me. It is the Holy Spirit who changes lives. He wants to use us, and it is a great privilege to be able to be used by Him. In the afternoon we had a great time at the Gym where all of us could enjoy sports and fellowship. 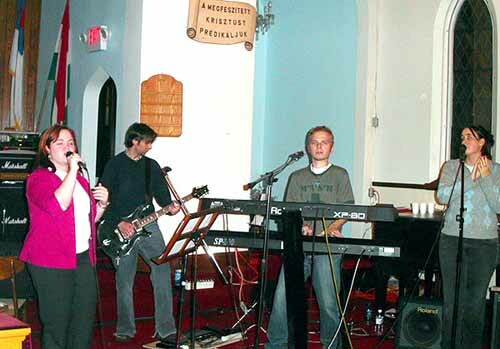 After the delicious supper, which was done by church members, we enjoyed a combined worship group. Altered from Cleveland, OH and Every Thursday from Nashville, TN lead us in music. Sharing our faith without fear can sometimes be challenging. Miko Steve had an awesome slide show about his trip on Paul's journeys. He said that we only control 10% of our circumstances, but 90% of how we respond to that 10%. The reason why this really reached down into my heart was, because his trip was an example of how to live that out. He shared about the many different circumstances that had challenged him, but because of his attitude and responses, he was able to share his faith. Fishing is an art. Pardi Felix was teaching about how to fish. There are several points of his message that are still alive in my head, and I can think of one specific one. He said that fishing requires faith. Those people who go out and fish, they step out in faith as they get ready. We need to do the same thing in a spiritual sense. We need to have faith to reach others for Christ. I have so many other great memories. I would like to say thank you to Herjeczki testver, who was working day and night, in order to make sure everything would go smoothly, as well as all the brothers and sisters who helped him put this weekend together. Thank you for feeding us with spiritual and physical food. We had the privilege of attending the new church dedication in Vac in October with our family. It was a wonderful experience and we were blessed by the spirit-filled weekend services. Because we arrived in Hungary on Wednesday night, we were able to observe the Thursday evening planning meeting. It was great to watch the pastor, Attila Melath, take on the role of Event Coordinator and go through the projected ceremony step-by-step. It was encouraging to see how each person attending that meeting took on some kind of a special role and responsibility for the weekend services. You could tell they had sacrificed a lot for this new building to become a reality and had been preparing for these services for a long time. All the preparation and organization paid off and the dedication ceremony and weekend worship services went very well. The dedication service took place on Saturday, October 2 and the 400-seat auditorium was packed. People from all over the country came to celebrate this momentous occasion. All the churches of the other denominations in Vac were represented by either their pastor or a delegate. Even the Mayor of Vac came to greet the congregation. Many of the people who brought a greeting to the congregation mentioned how impressed they were with the sacrifice, perseverance and hard work of the members of the congregation. The original planning for this new church building had started 10 years before, and it took a lot of preparation and execution to bring it to fruition. During Peter Lakati, Moderator= s brief presentation, the congregation learned that more than 90% of the cost of this building project was provided by donations from individuals in the congregation and by friends of the church. There was not a large amount of sponsorship from organizations. The majority of the actual physical labor was provided by the congregation, as well. This also shows the incredible sacrifice of each member of this small, but mighty congregation of the Baptist Church of Hungary. It truly serves as a testimony for the whole city of Vac. The celebration continued on Sunday with morning and evening Thanksgiving services. Once again, the church was full and you could really sense a mood of thanksgiving and praise throughout the day. The choir did a marvelous job and their hard work in preparation really paid off as they blessed the congregation with their beautiful singing. Special music was provided by the contemporary praise group Psalmus in the morning service as they shared one of their songs "I Could Only Imagine". It was very appropriate to have us think about our joy, thanksgiving and praise at the present time, but to also imagine how much more awesome it will be to do the same in the presence of Christ one day. The evening service was highlighted by many personal testimonies of those who came to know Christ as their personal Savior in the years while the construction was in progress. Most of these people had not grown up in the church or in a Christian home, but rather came to the church through an invitation by a friend or by curiosity. What was so powerful about these testimonies was to realize that while the actual physical building of the church was going on, at the same time the Holy Spirit was preparing hearts and the spiritual building of the church body was also happening. Because of the obedience and faithful service of the members of the small but mighty congregation, God allowed not only earthly growth and expansion, but also spiritual growth in adding to their numbers and allowing growth within individual members. Often the case with long and outdrawn building projects is that people end up getting "divorced" or "become bitter toward each other." This was not true in this case; rather the opposite happened and members of the congregation of the Vac Baptist Church became stronger and more committed through the tough parts of this journey. This serves as a testimony of God= s faithfulness and mighty work for all those who had been watching throughout the years. The prayer of the pastor and this congregation is that God will continue to use them to be a beacon of light in their community, and one-by-one people will come to Christ and they can fill this new auditorium with new members. They are also praying that God would allow them to baptize 40 new members in the new baptismal in the next year. We command the pastor and congregation for their faith, perseverance and hard work in not only completing this beautiful new temple, but also for continuing to reach their community for Christ. We thank them for blessing all of us who took part in the celebration. It truly was a spirit-filled, uplifting experience that we will carry with us as a reminder of how powerfully God can work through us if we are willing to be used by Him.